We are looking for Bay Area children (8-13 years-old) and their parents to give us feedback on the device and mobile game app to make our platform as helpful and effective as possible. In return for being part of our study, you’ll get access to our platform which provides real-time data on your child’s lung health. Stop spending time worrying about managing your child's asthma. 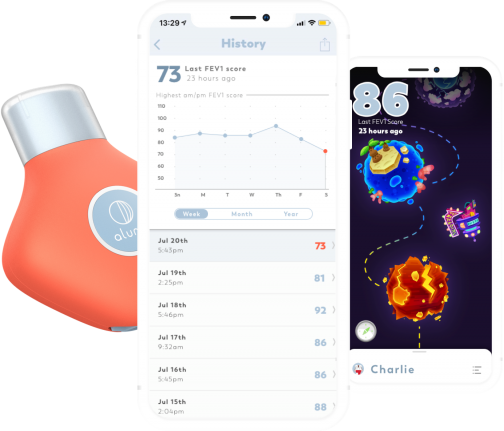 Aluna is designed to help children monitor their lung function in a fun and simple way. This device is a mobile spirometry exam, the same breathing test your child takes at the Pulmonologist’s office, that measures FEV1. Teaches your child how to manage their asthma. Reminds you to stay on track with your doctor’s action plan. Helps you and your child know that they are taking the right amount of medication. Gives you real-time information on your child’s lung function. Never miss recording an asthma attack, use of medication, and set reminders. Share with your doctors detailed and accurate health data so they can make better decisions about your child’s health. "I liked that it would track data that we could eventually even send to her doctor so that they can make better decisions about her health." "As a parent we want the best for our child. We want them to be healthy and to succeed and to be self-sufficient. Aluna has taught her how to take care of her asthma in a fun way." Does your child struggle with asthma? Help us help you! Enroll now for a chance to give your child the opportunity to experience youth the way they deserve, while alleviating your stress and worry.